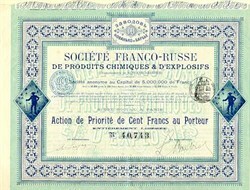 Beautifully engraved Bond Certificate from theSociete Franco - Russe DE Produits chimiques & d'explosifs issued in 1910. This historic and unique document has an ornate border around it with two vignettes of rocks exploding inside of a mine in front of an old miner. This item is hand signed by the company's administrators and is over 89 years old. There are at least 20 unused coupons not shown in the scanned image.